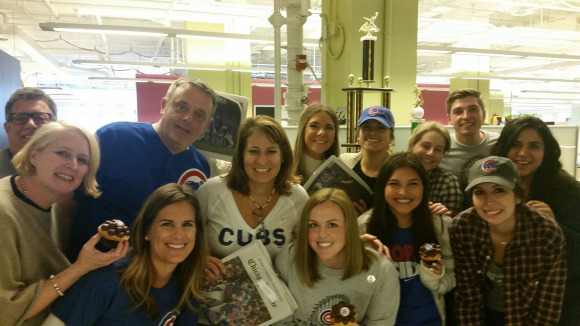 It hadn't happened in 108 years, so when the Cubs won the World Series, Chicago agencies went all out to celebrate. It was definitely not business as usual for PR firms in Chicago on Thursday. Agencies could not ignore the Chicago Cubs’ first World Series championship in 108 years, won early Thursday morning when the team held off a second comeback by the Cleveland Indians to win game seven of the 8-7 in 10 innings. Below is a roundup of how Windy City agencies are celebrating the Cubbies’ championship. The firm allowed employees to leave at 3:30 p.m. on Wednesday to get to their preferred viewing spots early. (Many Chicago bars began were packed with patrons by mid-afternoon). Olson invited its entire Chicago team to attend game six of the National League Championship Series, when the Chicago Cubs clinched a trip to the World Series by beating the Los Angeles Dodgers. More than 50 staffers attended. Chicago-headquartered Golin closed its Chicago office at 3 p.m. on Wednesday to send all staffers home. Some went elsewhere – the firm also gave employees the chance to work from Wrigley Field for the day. Edelman’s Chicago office opened late on Thursday, giving those who stayed up late—or popped open bottles of champagne in celebration—the chance to sleep in. On Thursday afternoon, the firm threw a happy hour to celebrate, complete with beer, peanuts, Cracker Jacks, and lots of W flags. Despite being headquartered in St. Louis, home of the arch-rival Cardinals, the Omnicom Group firm threw a Cubs-themed celebration this afternoon, where staffers got baseball fare such as mini hot dogs and popcorn, Cubbie cookies, cakes, cupcakes, and, of course, Chicago’s own Old Style beer. The firm will also hold a party on Friday at lunch during the Cubs’ World Series parade, which will end at Grant Park. Staffers will have front-row seats; Fleishman’s conference room overlooks the park. Burson U.S. EVP and Midwest market leader Erica Swerdlow designated two days for "The Burson Ballpark." The firm let employees come into the office late on Thursday and it plans to serve cakes, cookies, and ballpark food on Friday. All staffers are encouraged to wear Cubs gear. It is also asking staffers to show off their writing skills for a prize. It held an essay contest on Thursday to pick four winners to go to the victory parade and report on it for Burson’s internal media channels. Winners will also get two drinks and an official World Series t-shirt. 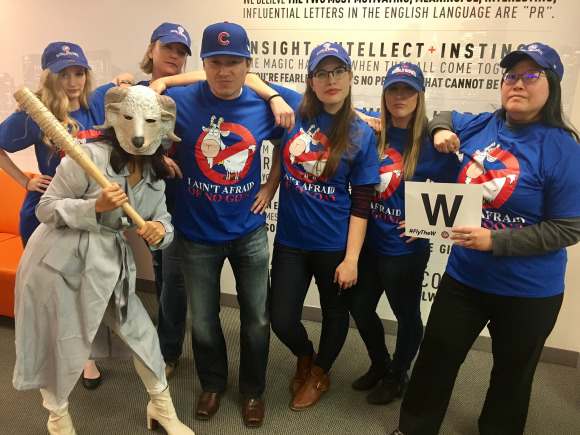 For Halloween, MWW’s team in Chicago dressed as "goat busters" in hopes of lifting the Cubs’ billy goat curse for Halloween. Cubs fans were permitted to wear their jerseys and caps on game days throughout the World Series. MWW’s Chicago and New York City offices celebrated with Chicago-themed lunches of deep dish pizzas, Chicago style steak sandwiches, and Chicago style hotdogs and fries. On Friday, MWW will host a celebration breakfast and give its team time off to attend the parade and rally. 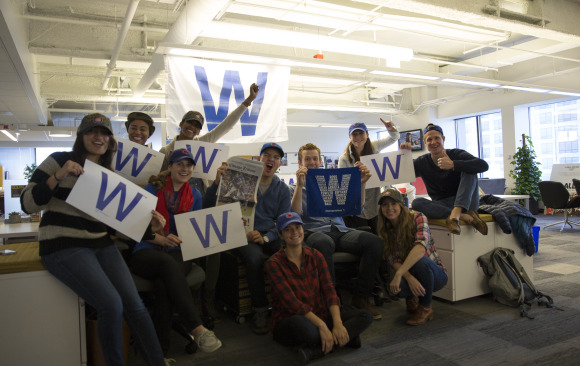 The agency’s Chicago office started celebrating the Cubs’ win as soon as staffers walked in on Thursday. Managing partner Dan Pooley had Cubs’ fan anthem "Go Cubs Go" playing as employees arrived. The firm also launched a new in-office MVP award for the post-season on Thursday. 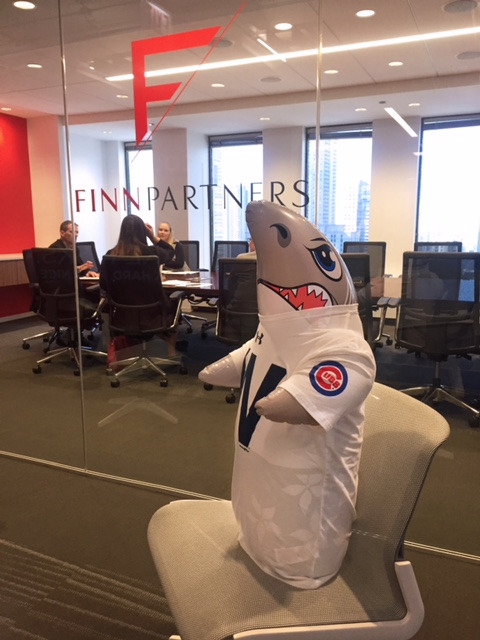 The firm’s office mascot, Finn (an inflatable shark), has also been sporting Cubs gear. Last week, hot-dog hawkers stopped by the office for game two of the series. 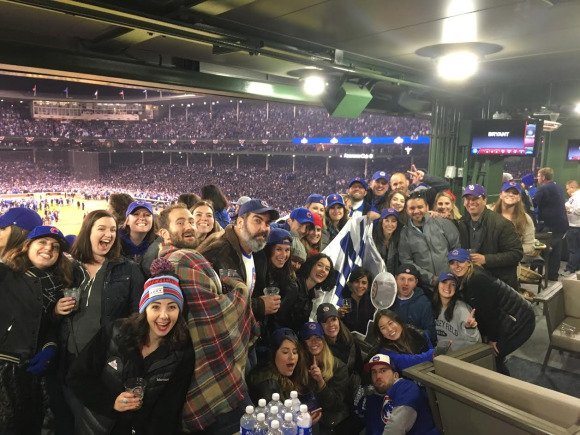 The firm also worked with client Levy, the official food, beverage, and retail partner of the Chicago Cubs at Wrigley Field to celebrate the playoffs throughout October and into the World Series, including launching playoff merchandise for the Cubs at Wrigley Field. The company’ communications leader Jon Harris, was at the clinching game seven in Cleveland on Wednesday night along with Al Roker. The Boys Taking In World Series! #gocubs #goindians. Thanks @alroker for being the best friend a guy could ask for!? ?